…aka stressful (if you’ve seen this scene from Home Alone, then you know what I’m talking about). But, my friends, that doesn’t mean it has to always feel stressful! I recently stumbled upon an article from Pure Wow about some travel packing hacks so I decided to add our own beachy spin to it and apply some of these tips (and some of my own) to beach travel over the holidays! 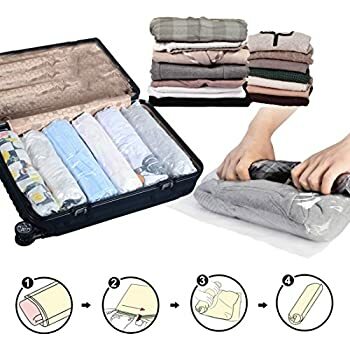 So here’s some quick and easy tips from packing tips to airport convenience to help you travel light, easy and stress-free during the holidays. I like to live by the motto “roll instead of fold” when I pack. Plus, it helps with avoiding as many wrinkles than you fold your clothes. It’s just easier we promise. According to PureWow, “TSA reserves the right to tear open your beautifully wrapped gifts. Play it safe with festive bags and some tissue paper.” This may seem minor, but it’s always better to be safe than sorry plus it saves room. *Not every All Inclusive is created equal, but most resorts will provide you a hairdryer. And guess what else you can leave home? Toothbrush, toothpaste, shampoo, conditioner, body wash, bug spray, water bottle, towel. (If you’re wary, ask your BeachMaster about what all the hotel includes). My husband and I decided to invest in clear zip bags from Target that included travel sized bottles for all our toiletries. Not only was the bag more sturdy than just a throw-away ZipLock baggie, but it helped me minimize my liquids. An easy way to do that ladies is to try make-up wipes instead of liquid make-up remover. This may seem minor, but having your headphones easily at the ready can help you avoid the stress around you while the rest of the airport isn’t abiding by these travel tips. Wrap your headphones and chargers so you can easily access them. As far as only long “chords” in your suitcase, I’ve ruined far too many necklaces by getting them all tangled up together or in clothing zippers. So, put your necklaces in a straw or separate small jewelry into individual ZipLock baggies. Think “light” and “pockets”. Don’t bring a puffy jacket to the airport. I repeat, don’t bring a puffy jacket. You will wear it once maybe while you’re walking into the airport and then you definitely will not need that at your All Inclusive. Also having pockets allows you to easily whip out your phone, wallet, passport, passport holder, etc. when going through TSA. Also, don’t forget to bring shoes that easily slip on and off. This was a new travel hack for me as well! According to Pure Wow, “The TVs dotting every gate have USB ports on the back. Plug yours in and watch everyone else claw for the regular outlets.” Genius, right? I thought so too. Yes, space-saver bags are still around and no, they aren’t lame. Having a no vacuum space-saver bag could very much come in handy, especially if you just can’t decide what to bring and what to rig the system. Looking to travel over the holidays? Give us a call! A friendly BeachMaster will be happy to send you to paradise!